A war was raging across the globe and there were many vacant chairs at dinner tables that Christmas of 1942. They were vacant either through the absence of a loved one serving his country in some far flung place across the world, or sadder yet the chairs may have been made permanently vacant to due death from war action. On the world scene that Christmas the gallant forces of the Red Army were holding the line in Russia against the relentless fascist hordes of the Nazi army. The Russians bagged more than 110,000 Nazi soldiers in six days of fighting 105 miles from Rostov-on-the-Don. American and British troops were battling the Germans in North Africa. In the Pacific heavy bombing raids by Allied planes battered the major Japanese base at Rabaul on New Britain. The Allied forces still saw many grim tasks before them on their way to victory on two fronts. On the home front it was announced that more than 140,000 pounds of silk and nylon were salvaged from 2.8 million pairs of hosiery for use in the war effort. The sports world was shocked at the death of 1928-1929 Army All-America football player Red Cagle, who died after fracturing his skull in a fall down some subway steps. Locally, according to Postmaster Frank Plankenhorn, the Williamsport post office handled 1,143,195 pieces of mail during the Christmas 1942 season. Much of the mail was bound to soldiers serving their country. Parcel post almost doubled from 1941 levels. W.F. Miller of 18 E. Jefferson St. built an elaborate train layout, containing three trains and an Army camp, an airport, a village and many other items. Robert Tompkins, son of Mr. and Mrs. R.S. Tompkins of 312 Louisa St. was home on leave from the Army and he constructed several train layouts at his parents’ home. At his Army camp he had been requested by several officers there to build several Christmas train platforms for them. Tommy Richardson, local well-known car dealer and president of the Eastern Baseball League received Christmas greetings from well-known comedian Joe E. Brown. At movies here in Williamsport, the Keystone Theatre was showing “Little Joe the Wrangler,” starring Tex Ritter and Johnny Mack Brown. The Karlton was showing “Flight Lieutenant” with Pat O’Brien and the “Fighting Texan” with Ken Maynard. The Rialto had “Whistling Dixie” starring Red Skelton, Ann Rutherford and Guy Kibbee. And the Capitol’s feature was “The Black Swan” starring Tyrone Power and Maureen O’Hara. 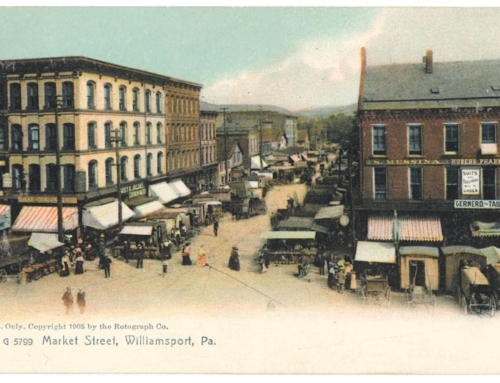 The Gazette and Bulletin, Williamsport’s morning newspaper cost just 4 cents an issue. The Gazette and Bulletin on December 24, 1942 editorialized in part, “Lustful, bloodthirsty tyrants have risen in a world which should today be echoing a message of peace on earth and goodwill toward men, and those tyrants must be suppressed with all the power the force of might can muster.